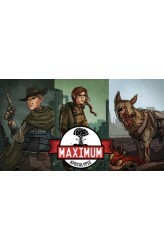 Maximum Apocalypse is a cooperative roguelike adventure game for 1-6 players. In Maximum Apocalypse, civilization has already fallen. The players are survivors of the apocalypse whose mission is to survive the hostile landscape. The game map is randomly generated and different every time that you play. On each turn, a player can use up to four actions to explore the map, play cards, equip weapons, scavenge for resources, draw cards or battle off monsters. Picking a unique survivor class within the group, players must plan their strategy and work together while leaning on their survivor’s strengths in order to defeat monsters and avoid starvation. For example, the Fireman is deadly up close with his ax and can easily chop down monsters; meanwhile the stealthy Hunter is great..
Gothic Horrors is a deluxe expansion for Maximum Apocalypse. The supernatural is real. Unspeakable horrors await those who venture out at night. Vampires drain the life of their victims while cultists summon strange creatures. We’re hoping that we can scrounge together enough supplies to survive without our minds snapping, but it is a heavy burden to bear. 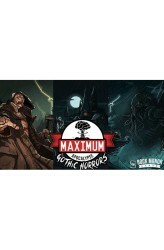 Maximum Apocalypse: Gothic Horrors adds two new apocalyptic scenarios, Cthulhu and Vampires. Face off against life draining vampires, ghouls and werewolves in a classic monster set or try and stop a bunch of cultists from summoning Cthulu or other unspeakable Lovecraftian horrors. Each apocalypse brings with it new gameplay mechanics such as the Insanity deck of phobias or the new night/day ev.. When monolithic beasts rose from the oceans, our military tried to stop them. As we killed them at great expense and destruction, more kept rising from the depths. Our world is theirs now. They roam the landscape as an ever present threat while the last of us scrounge on what’s left from our crumbled civilization. 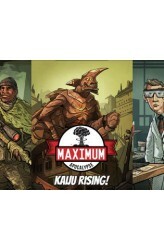 Maximum Apocalypse: Kaiju Rising adds two new survivor characters, the Army Ranger and Scientist. Each character comes with their own unique survivor deck of abilities and equipment cards. The Scientist is clever and adaptable whereas the Army Ranger is an excellent sniper and crowd control character. Finally, this expansion adds a new apocalypse deck of 30 cards with new missions and challenges as you face the largest monsters seen thus far. ..